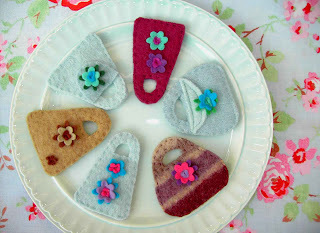 My first post from my new Pampootie blog, gallery and online shop! Plenty of hand-crafted delightful loveliness to inspire and cheer. Including creative adventures, gorgeous things from my studio, signposts to amazing creative people, cool hints and tips, a tutorial or two, musings on getting started and staying inspired, and my own creative story too. Have a look around – I’d love to hear what you think, so do let me know. Be a Pampootie Tweep and keep in touch on twitter @PampootieElaine too. Have a browse through the posts below, and you’ll see what I’ve been up to over the last few years. 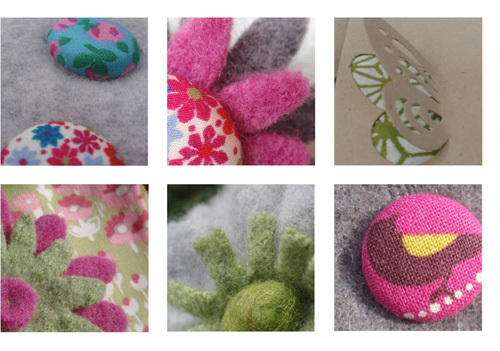 To get your mitts on Pampootie creations, check out the shop for details of where and how to buy! NEWSFLASH! I’ll be at the Christmas Market on the 3rd December at the Ropewalk - maybe see you there? Exciting things are afoot – lots of new creations in the pipeline, as well as workshops from my studio at the Ropewalk. The adventure starts here – exciting! 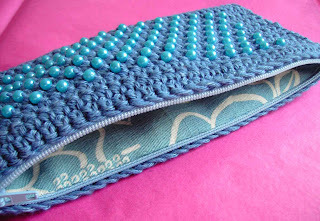 A little beaded crochet bag I designed for my friend Jo as a gift. It’s lined with vintage silk kimono fabric bought in Japan. 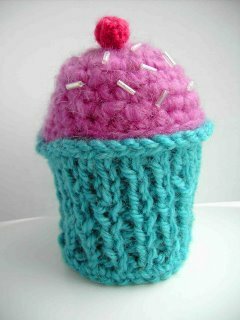 Knitted, crocheted and beaded for friend Berni’s 40th birthday. Kinda dinky, kinda fun. 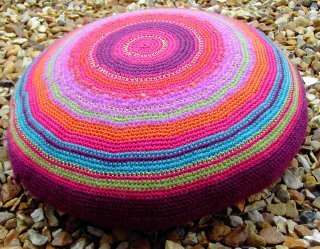 A special cushion I designed and made for a friend. Crocheted in the round with lots of different yarns – mainly wool and silk. I’m pleased how it turned out as I didn’t know what would happen…it evolved! Delighted to say that Berni loved it. Happy meditating…………..
Knitted from a Teva Durham pattern, this was a Christmas gift for my Mum. She loves this and wears it a lot – especially when walking as her arms get chilly. 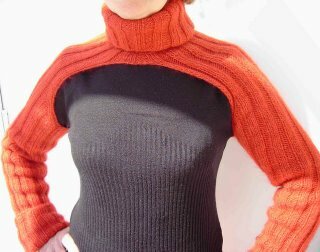 She also wears it as a scarf with the sleeves wrapped round her neck – versatile or what!! I really, really love this skirt! 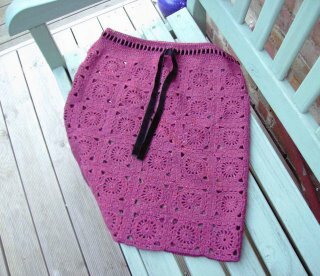 My first finished crochet project, and when I told people I was making a skirt with motifs they all looked horrified. I could hear the ‘Granny Square Alert’ sirens and expected the ‘Anti-Doily SWAT Team’ to leap from the bushes and take me away for my own safety. Pleased to say that it’s all been lovely compliments at dawn since they’ve seen the finished article. Here’s the latest shrug from my needles – a Christmas present for Mum. 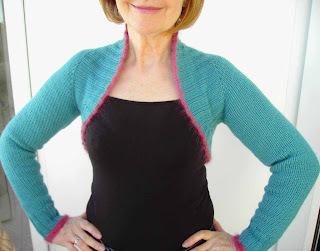 It’s Stephanie Japel’s shrug from ‘Fitted Knits’. My first attempt at ‘top down’ knitting and it’s so easy. I used one colour, rather than two as the pattern suggests and instead added some gauzy kid silk haze to the edges for a delicate look. I’m really pleased with it and Mum is too. 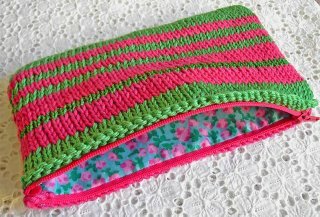 More pics on Ravelry. 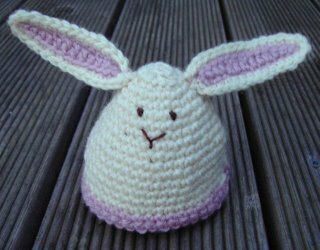 A small bunny egg cosy, with big bunny ears. My very own crocheted interpretation of the knitted Noblin Bunny by Abi Flynn Jones (magknits April 2006). 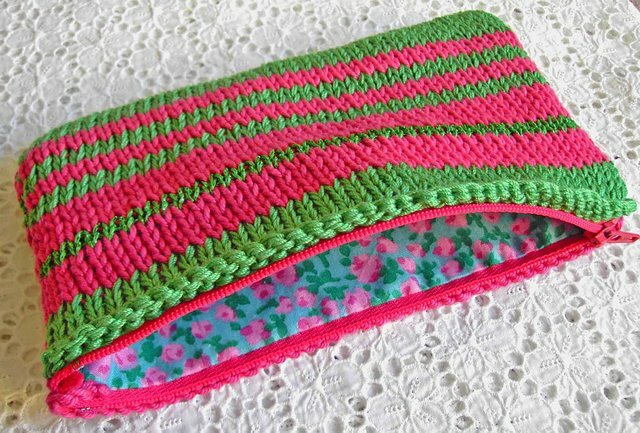 A little zippy knitted purse insipred by the green and pink flowers on the piece of vintage fabric used to line it. This gorgeous fabric came from my Grandma some years ago and I’ve always loved it and wanted to make something pretty with it.